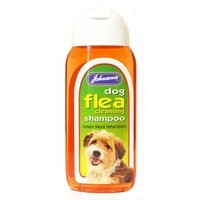 Johnson’s Flea Cleansing Shampoo is a mild and non-irritant shampoo for use on all breeds of dogs and puppies. Designed to help cleanse your dog’s coat from fleas, the shampoo will also deodorise and beautify it to leave your pet smelling clean and fresh. Johnson’s Flea Cleansing Shampoo should be used periodically as part of a programme that includes grooming for best effect.